Cascade Apricot Ale is based on our Temptor Triple Ale that has undergone over 8 months of lactic fermentation and oak barrel aging. 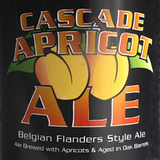 Ripe NW Apricots are fermented with this beer for 3 additional months. This hand packaged and bottle conditioned ale will only get better with age.